Even back in the 14th century, Fabriano's paper mills were producing a million sheets of paper a year and it was here that watermarked paper was developed. Its paper is still used the world over for bank notes and quality art paper. So proud is the town of its traditional industry that it has dedicated an interesting modern museum to it - you'll find the Museo della Carta in the former monastery of San Domenico to the south of the town on Largo Fratelli Spacca. You can also buy Fabriano paper here. 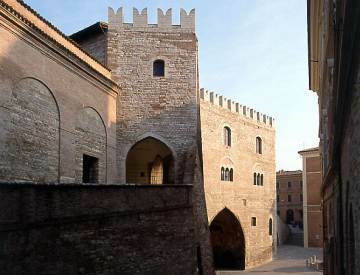 While the industrial sprawl of the suburbs promises little, it is worth penetrating to the heart of the town to see the opera-set main Piazza del Comune (above) flanked by the gothic Palazzo del Podesta' with swallow-tail battlements. Centre-stage is a smaller version of Perugia's famous fountain built at the close of the 13thC. The town was the birthplace of Gentile da Fabriano, Italy's greatest master of the late 14thC International Gothic style of painting. You will have to make do, however, with works by his followers, best of whom was Allegretto di Nuzio - you can find his work in the Pinacoteca Comunale in tiny Piazza Umberto I behind the main square, and in the Duomo next door. Also in the Duomo are handsome frescoes by Orazio Gentileschi, a 17thC follower of Caravaggio who ended his days as court painter to King Charles I of England.